Malta’s Christian roots go back as far as A.D.60 when according to tradition St. Paul was shipwrecked here on his way to Rome to stand trial. It is hardly surprising then that the Maltese still harbour a strong Christian tradition notwithstanding the rapid secularisation that has occurred in recent years. Malta’s Christian roots go back as far as A.D.60 when according to tradition St. Paul was shipwrecked here on his way to Rome to stand trial. It is hardly surprising then that the Maltese still harbour a strong Christian tradition notwithstanding the rapid secularisation that has occurred in recent years. This tradition reflects itself in the huge number of churches and chapels on the islands – reputedly around 360 of them. The earliest surviving churches are simple rectangular structures or troglodyte churches. 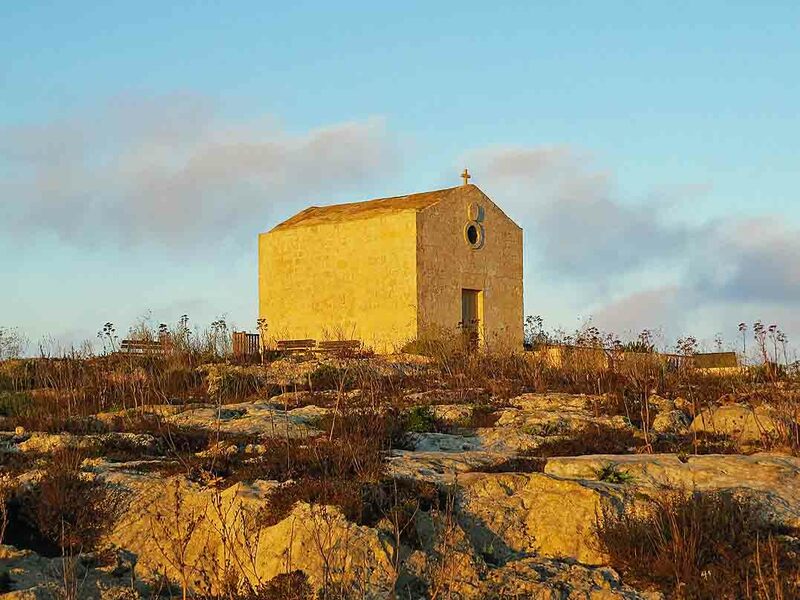 Among the best examples one finds the chapel of Hal-Millieri in the vicinity of Zurrieq, and the one at Bir-Miftuh next to the airport terminal. Both are of medieval origin and both display frescoes – something of a rarity in Malta. With the coming of the Knights and their material and artistic affluence a new era of church building was initiated, one in which nearly every town and village endeavoured to outdo the other in the size, splendour and magnificence of their churches. Most of these churches are in the form of a Latin cross with a dome at the crossing and one or, more usually, two bell towers on the west front. The city of Valletta alone boasts 25 of them, foremost among them the Knights’ pièce de résistance St. John’s Cathedral, designed by Gerolamo Cassar – the first local architect of any note. Also worth a visit in the city is the Jesuits Church in Merchants Street, the first Baroque church in Malta, dating to 1640. The parish church of St. Paul Shipwrecked is another richly adorned church. The parish celebrates one of the few feasts held in winter – on the 10th February, the reputed day of the saint’s arrival on the island. 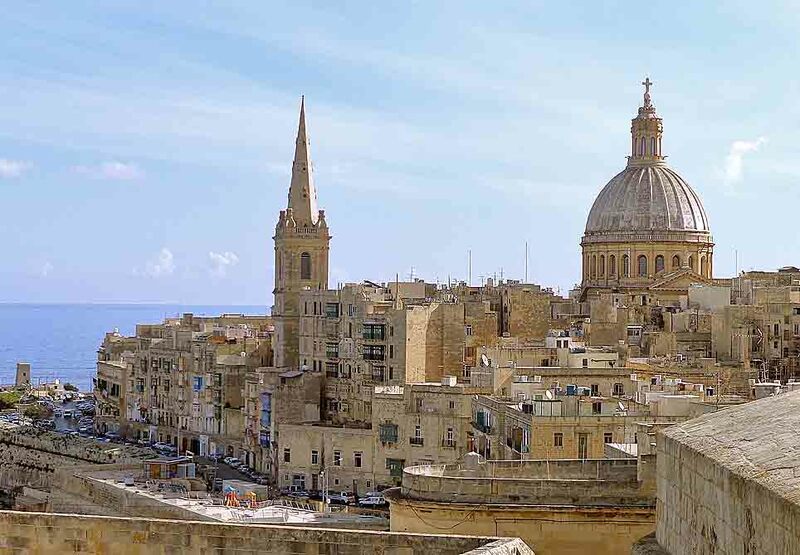 The first church to be built in Valletta was Our Lady of Victory in South Street while directly opposite one finds the elegant church of St. Catherine of Italy. Valletta also has a second cathedral – the Anglican Cathedral of St. Paul commissioned by Queen Adelaide on a visit to Malta in 1839. The cathedral is built in a neo-classical style with a somewhat severe interior, but its elegant spire remains one of the city’s best loved landmarks. 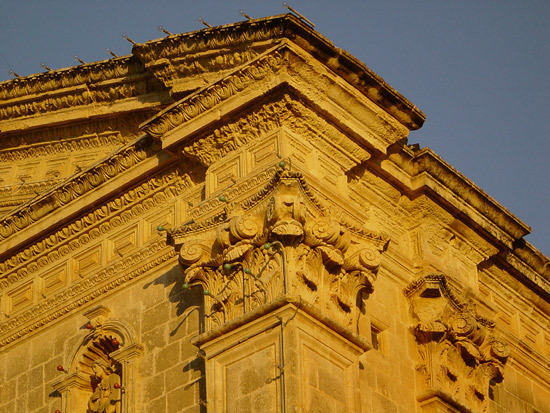 The earliest churches of any size in Malta show some hesitancy in their handling of dome building, probably reflecting the lack of architectural know-how at the time. Thus both the old parish church of St. Saviour in Lija as well as the ancient church of St.Gregory in Zejtun sport somewhat awkward, low domes. 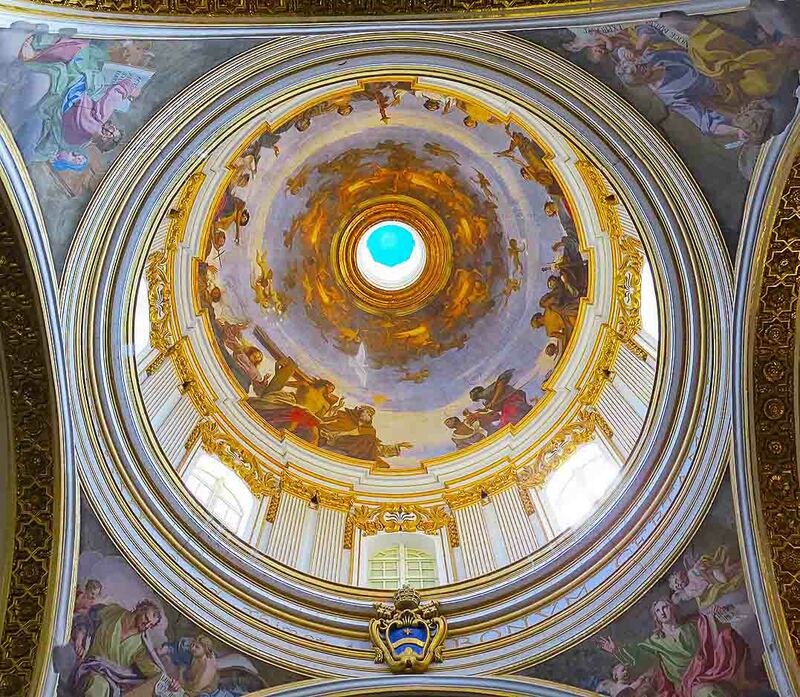 This soon changed when local architect Lorenzo Gafa (1638-1703) started experimenting with more daring designs – culminating in his finest dome on the Mdina Cathedral. 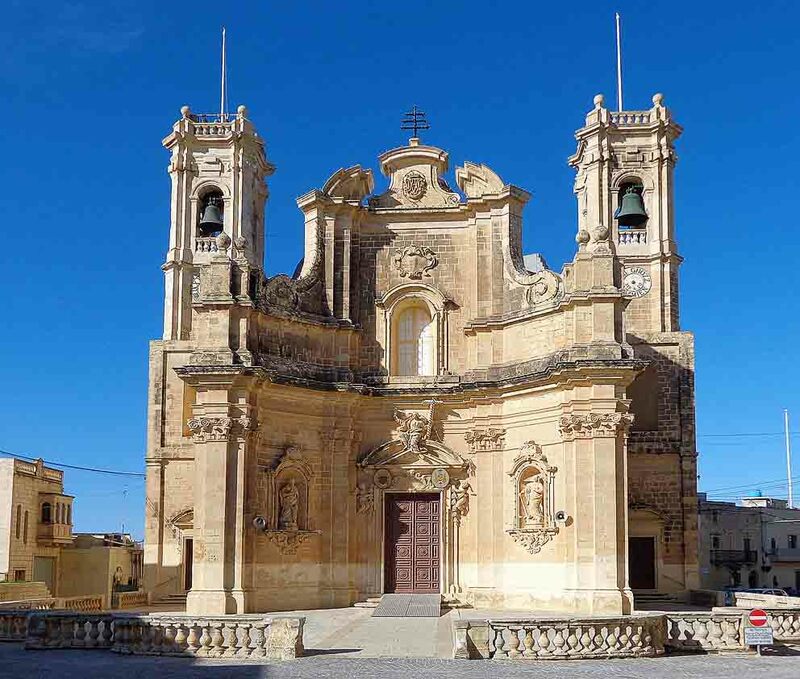 Gafa was also responsible for some of the more magnificent parish churches, St. Catherine in Zejtun, often referred to as the ‘cathedral of the south’, the church of St. Lawrence in Birgu, where he is reputedly buried, as well as smaller structures like the lovely Tal-Hlas sanctuary – set in the countryside near Qormi. Another architect who left his imprint on local church building was Tumas Dingli (1591-1666) responsible for the parish churches of Zabbar, Gudja, Naxxar, Gharghur and Zebbug – all of which went through alterations that virtually obliterated this architect’s signature. Dingli’s work can best be appreciated at the parish church of Attard where the original structure built in 1613 – when Dingli was a mere 22 years old – still stands. It is the island’s best example of Renaissance church building, complete with an exquisitely carved doorway, certainly the loveliest on the islands. Dingli’s mark is also apparent on the façade of St. Mary’s church in Birkirkara where the decoration and stone carving are again prominent features. Dingli – a resident of Attard – is fittingly buried inside his masterpiece. 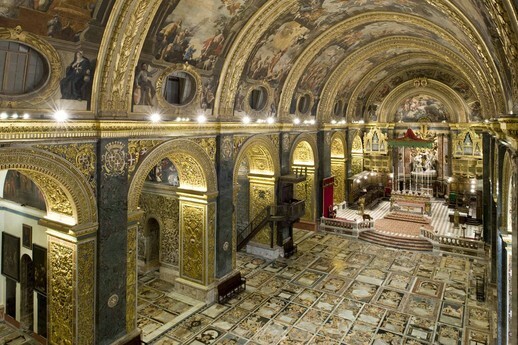 One of the last major baroque churches to be built in Malta is the Basilica of St. Helen in Birkirkara. Constructed between 1735 and 1745, its design is attributed to Domenico Cachia. It’s a huge church with a powerful dome and façade which are its twin glories. Certainly the finest parish church in Malta. The nineteenth century continued with some more church building – invariably with a disproportional if outdated baroque influence. One exception is the church of St.Gaetan in Hamrun, built in a confused Romanesque style and originally planned to have a large octagonal spire at the crossing instead of the present dome – a feature that would have been a novelty for a Maltese church. Unfortunately this was not to be and today the church presents a somewhat sad picture, located as it is on one of Malta’s busiest thoroughfares and saved only by the sumptuous ceiling paintings of the artist Emvin Cremona. Another nineteenth century church built with more than a bit of ambition is the one of the Assumption in Mosta, better known as the Mosta Dome. Built by the Maltese architect Giorgio Grognet de Vasse it is indeed a massive structure with 30 foot thick walls supporting a dome with an internal diameter of 122 feet. The dome itself is reputedly the third largest in Europe. Based on the Pantheon in Rome, its design is rather flawed by the addition of two uncomfortably squat towers on its façade. However its reputation was made when a German bomb pierced the dome during World War II but failed to explode. A miracle or just a rare failure of German precision technology? The locals prefer to think it’s the former. Gozo has a number of notable churches too. Foremost among them are the churches of Rabat; the Cathedral of St. Mary aloof in its citadel while across town The Basilica of St. George is probably Gozo’s finest, and certainly richest, church. The churches are the seats of the two fiercely rival parishes of the town. Over in western Gozo the village of Gharb has a church with a unique concave façade constructed in 1699. Like Malta, Gozo does believe that size matters and this is best seen in Xewkija, where the parishioners started the construction of a huge church with a dome to rival Mosta’s as late as the 1950’s, a project that took more than thirty years in the making, with the church only completed in 1981. It boasts the third largest supported dome in the world. 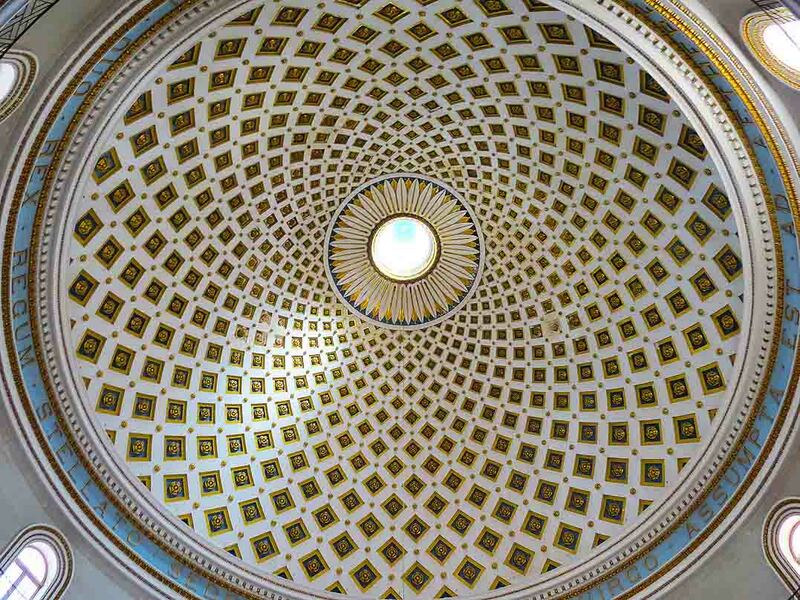 As numbers go it’s impressive; the dome is 74 metres high, the highest in Malta and a full six metres higher than London’s St. Paul, with a diameter of 27 metres and a circumference of 85 metres. Its total weight is calculated to be around 45,000 tonnes. Sadly it’s almost an exact (if inflated) copy of the Santa Maria della Salute church in Venice but is understandably a huge crowd puller nonetheless. 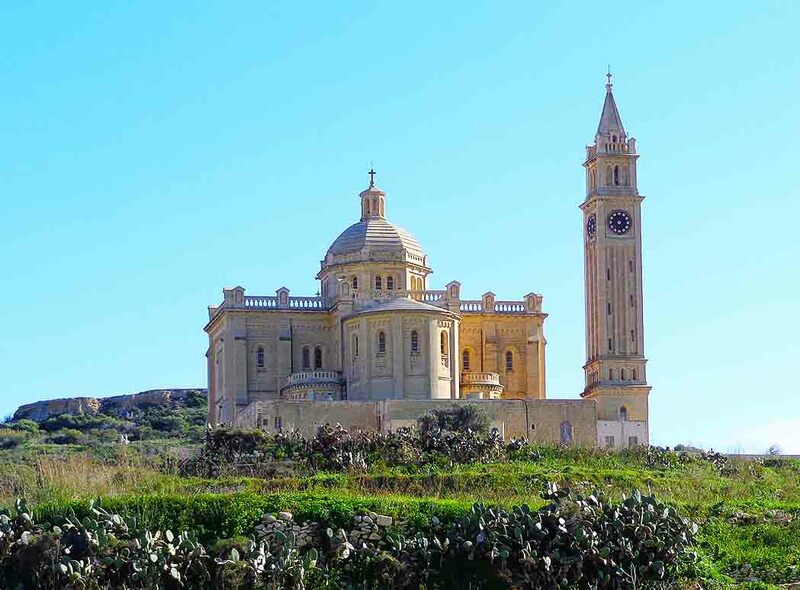 Perhaps Gozo’s – indeed the islands’- finest and most evocative twentieth century church remains the Ta Pinu National Shrine close to the hamlet of Ghammar. Built between 1920 and 1931 in the Romanesque style, it is splendidly sited in open countryside. The church remains a huge draw for pilgrimages to this day and the locals’ devotion can be felt in a roomful of poignant offerings for perceived intercession. The highlight of the church is however the intricate stone carving of its interior with a huge variety of patterns and motifs with no single design repeated. The sanctuary is invariably (and quite rightly) included on any whistle-stop tour of Gozo. Modernity in church architecture is a rarity in Malta and the results are varied. 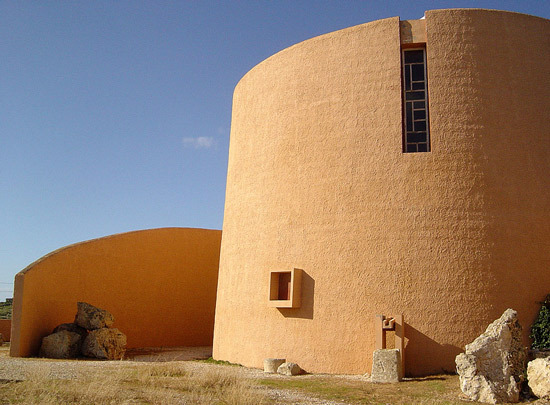 Arguably the most successful attempt is Richard England’s church at Manikata, where the church’s circular forms echo the apses of the ancient megalith temples. In addition to the major churches listed above, the islands’ countryside is dotted with wayside chapels; most of them are in a good state of upkeep though they are invariably closed most of the time. They are an important staple of the Maltese countryside and have their unique charm. Please remember at all times that, unlike most of the continent, the churches of Malta are mainly places of worship, so discretion in dress code should be applied when visiting. Discretion is also called for when religious functions are taking place. Although the major churches of Valletta, Mdina, Rabat, Mosta, Xewkija and Ta Pinu are open all day, most of the other village churches open only at times deemed convenient to serve the community. A rough estimate is 6am to 9am (and up to 12pm on Sundays) and 4pm to 7pm.